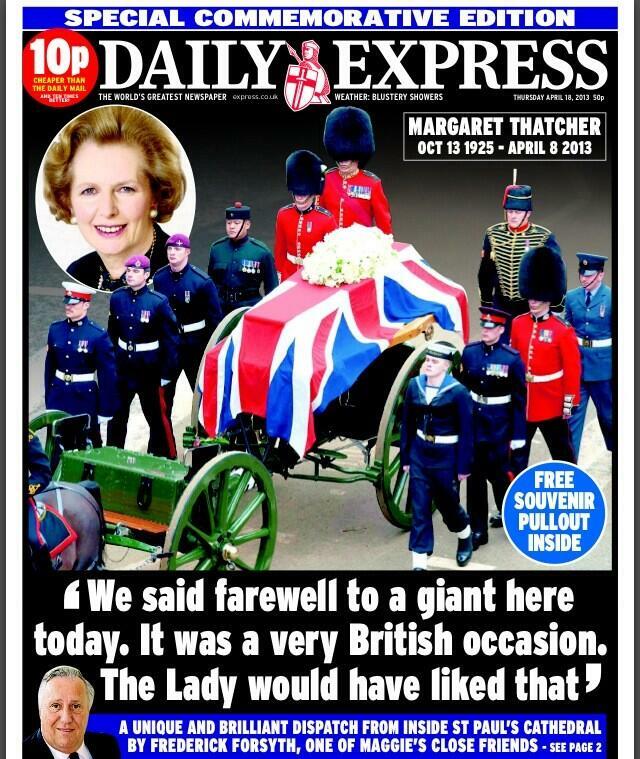 Covering the Margaret Thatcher funeral was always going to be tricky for some newspapers. 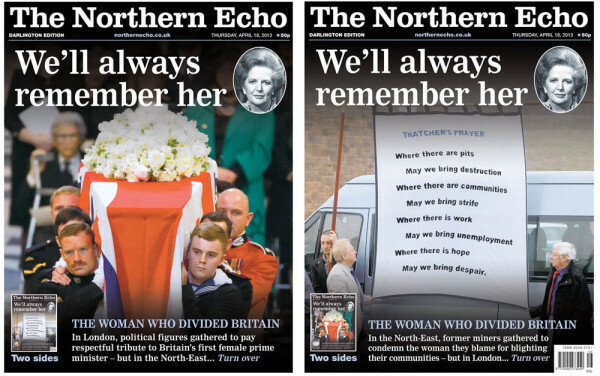 So, full marks to The Northern Echo for this brilliant piece of creativity. The paper is publishing two front pages, one on each side of the paper. 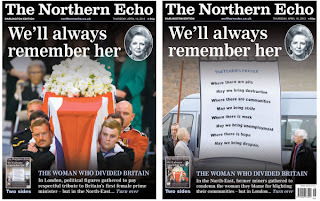 Editor Peter Barron says: "A letter is being sent to newsagents in the North-East and North Yorkshire explaining that there are two front pages on opposites sides of tomorrow's paper: one which captures the respectful tribute paid by political leaders in London; and one which shows former County Durham miners unfurling a banner condemning her economic record. "Newsagents are free to choose which of the pages they wish to display on their shelves. I dare say, it will be the version showing the miners' protest in places such as Easington, County Durham, and the more respectful front page in the likes of Richmond, North Yorkshire." Brilliant stuff. Read about it here. 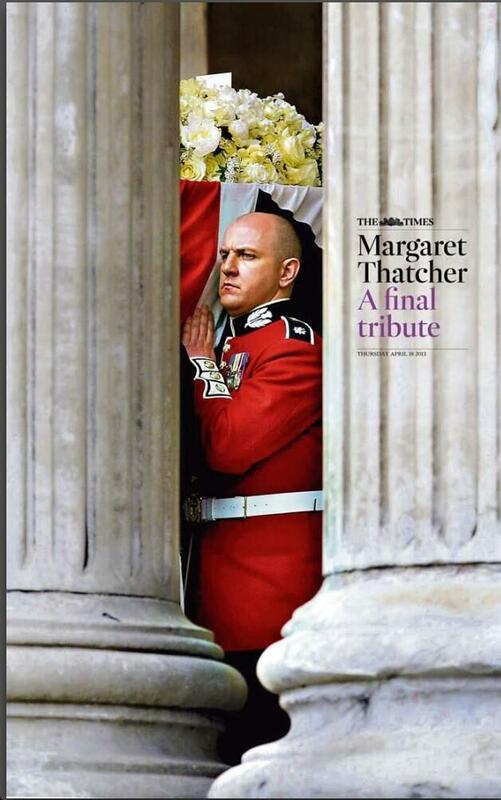 Elsewhere there were plenty of photos to choose from so, perhaps, surprisingly no two papers use the same one on the front page … and few use a picture of Mrs Thatcher herself. The Daily Mail chooses the human touch with a really powerful page. Instead of the fairly safe option of the coffin, it goes for a picture that reminds us all that, amid the divisions and politics, she was still someone's mother. I imagine those who are in the anti-Thatcher camp will cringe but it is a stunning image and headline. Politics aside, this demonstrates the power of simple layout. Good design is about telling a story - which is why this works. 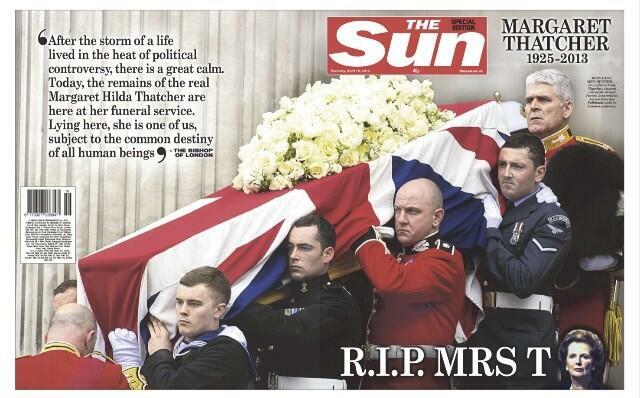 The Sun goes for a wraparound - and a reverential serif headline. In the best Sun tradition though, the headline rhymes. 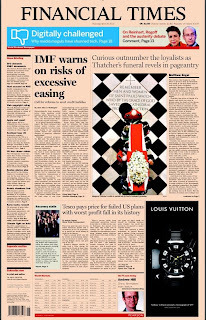 The cutout of Mrs Thatcher rising from the bottom of the page looks a bit peculiar to me - but a strong page nonetheless. 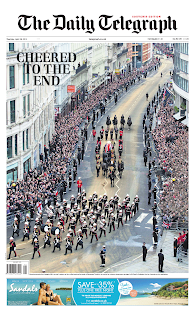 The Times has become the master of the wraparound, although sometimes the design dictates the picture instead of the other way round. This is a case in point. 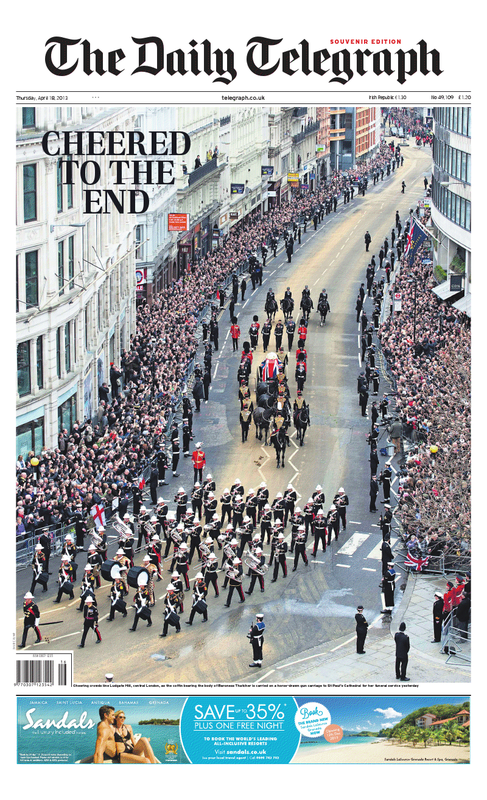 The front page is strong but I'm not sure the back page adds much - plenty of steps and the backs of head. This framed picture, on the inside supplement, is very effective though. It is a great shot - and there can be no doubt that it is of a very British occasion. 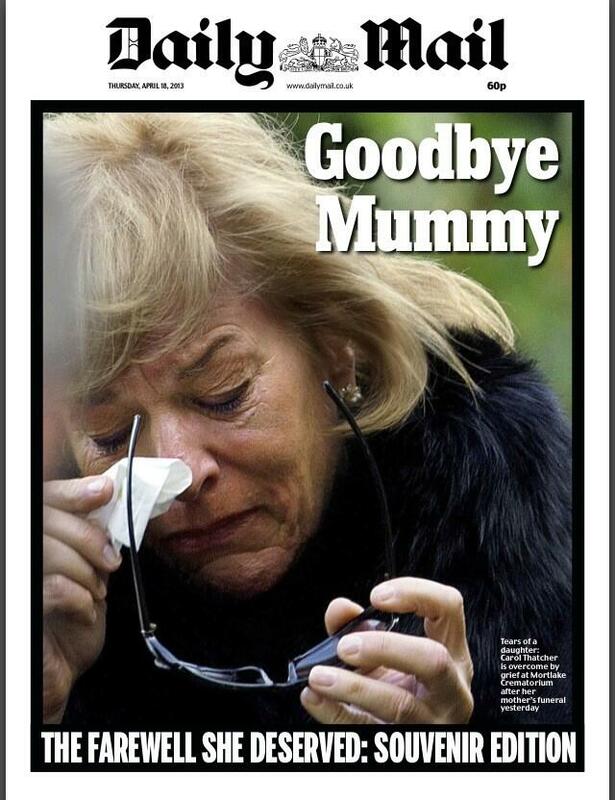 The broadsheet format lends itself to occasions such as this ... all that front page space to play with. 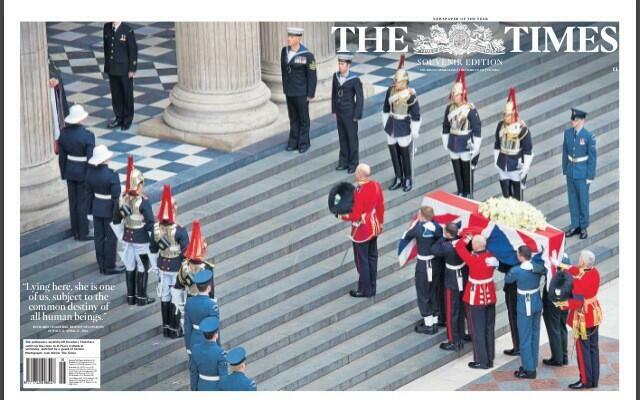 The Daily Telegraph does it well, setting the context with an aerial shot. 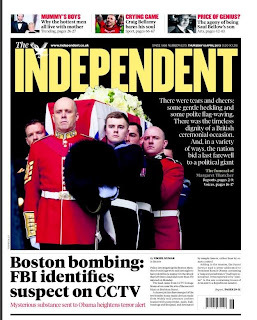 A great photograph and the kind of picture-use that the Independent pioneered back in the mid-80s. The Telegraph is the only paper that carries an advert on its front. I hope it charged a premium. 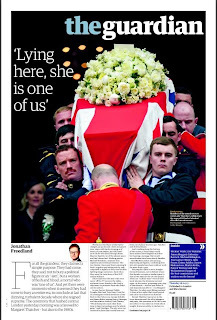 The Guardian goes for strong head-on shot of the coffin. 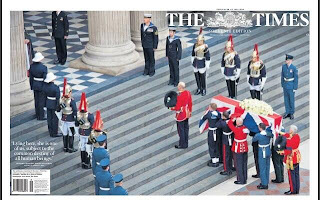 The faces of the military pall-bearers capture the solemnity and, perhaps, pride of the occasion. A Jonathan Freedland colour piece also graces Page 1. 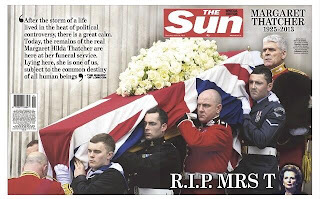 The Independent also goes for a head-on coffin photograph, showing the expressions of the pall-bearers. A solemn and dignified picture - although perhaps overshadowed a little by the yellow titlepiece. 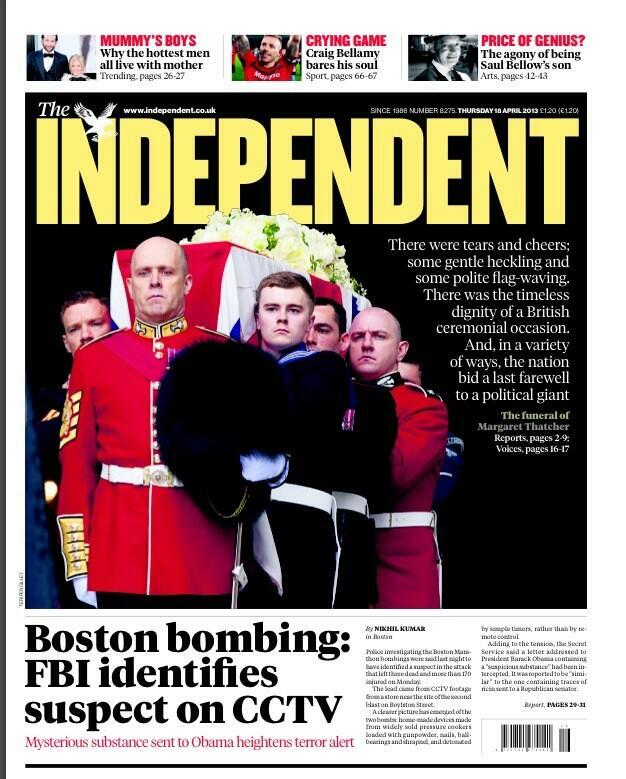 The Indie decides that the Boston bombing is also worth Page 1. 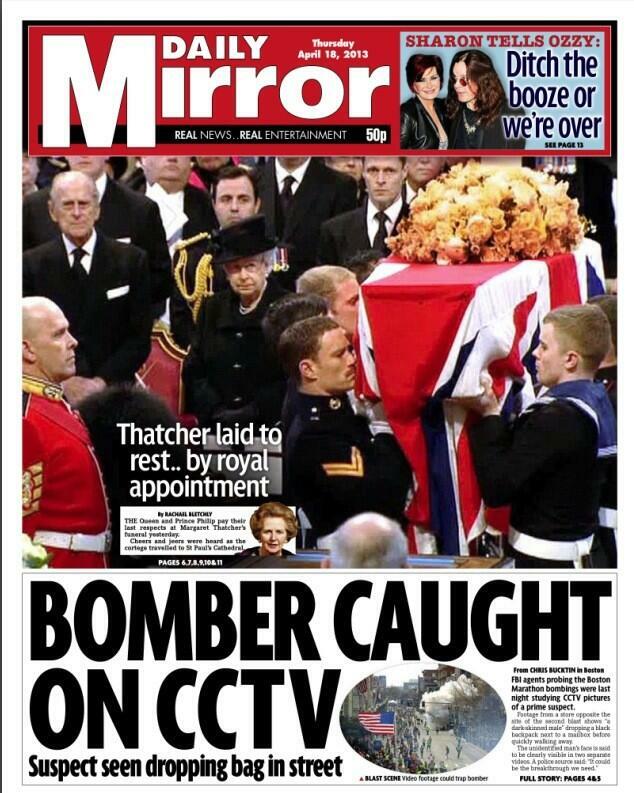 If I expected one paper take a less than reverential approach it would have been the Daily Mirror. 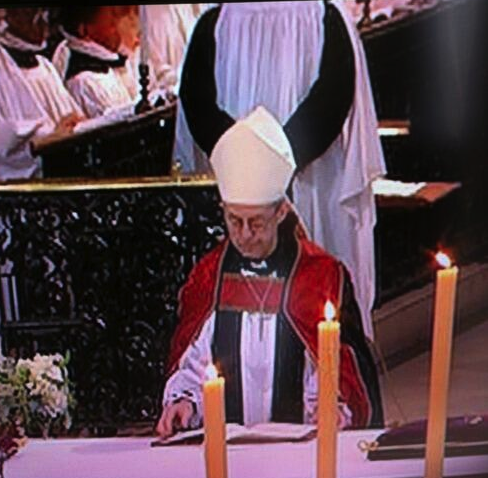 But the paper plays it fairly straight - taking the angle that the Queen and Prince Philip were there to pay their respects. 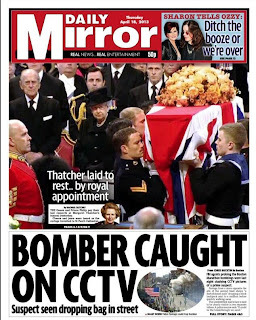 If there is a hint of disapproval it comes in the form of the headline - Thatcher rather than Mrs Thatcher - and the fact the Mirror decides there was a more important lead. 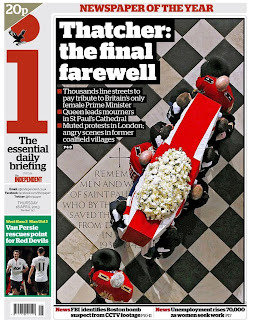 The i goes for an aerial shot - an innovation that was used by newspapers covering the funeral of Winston Churchill in 1965. 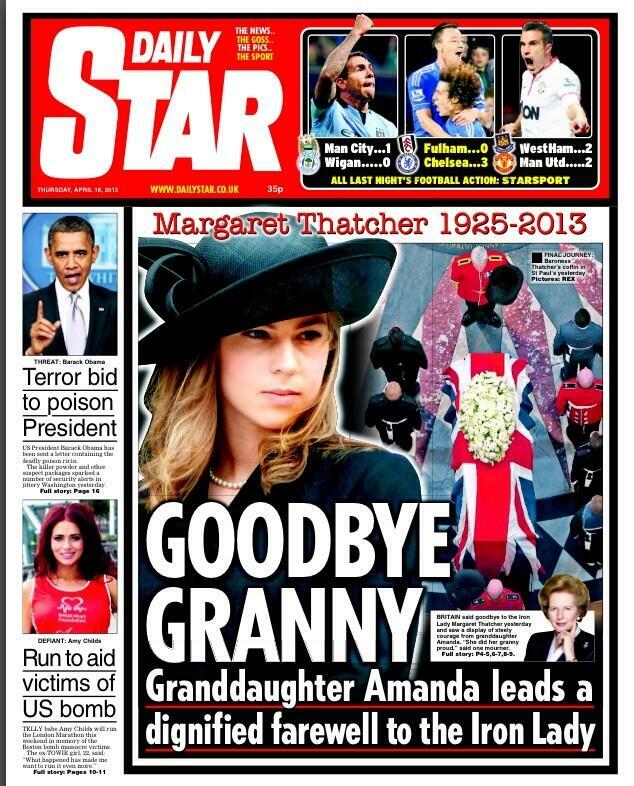 It also opts for Thatcher rather than Mrs Thatcher. 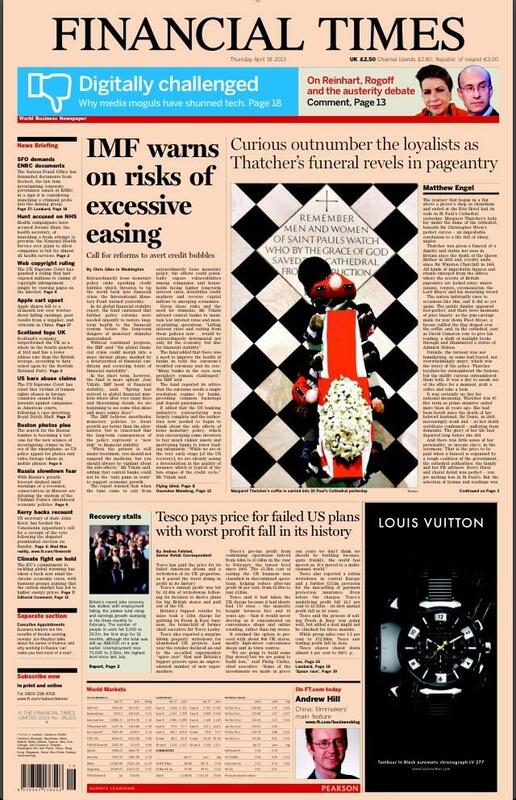 The FT goes for an aerial shot too. I like the crop here - the pattern and engraving of the floor contrasting with the colour of the coffin. 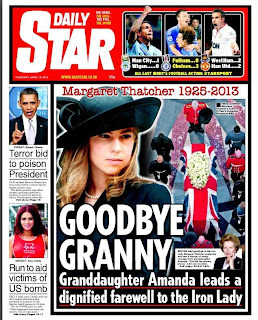 In line with its policy of using young women on its front page, the Daily Star skips a generation and focuses on granddaughter Amanda. To be fair, she is a good angle. She is only 19 and spoke with composure and dignity. Interestingly, the BBC found itself leading on her late last night too. 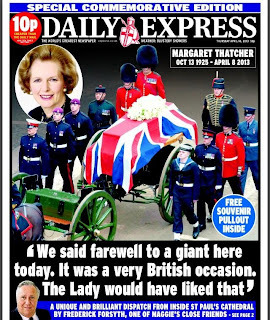 The Daily Express chooses a picture of the coffin on the gun-carriage and trails a dispatch from inside St Paul's by author Frederick Forsyth. Finally, even at funerals there can be moments of humour, so here is a picture which, whatever your view of Mrs Thatcher, should make you smile.